Studio Ghibli season continues and we switch visionaries. 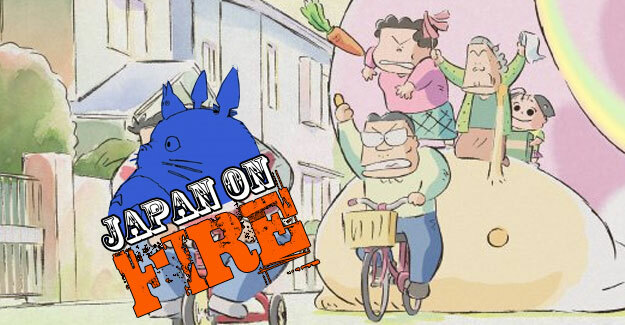 This time Isao Takahata gets his due with a brief bio before Stoo and Ken dive deep into the sparsely animated family comedy My Neighbours The Yamadas. A movie that has not yet got its domestic abuse sequel despite being a domestic snapshot. One can dream. We had mic troubles on Stoo’s end so for a few minutes between 22.49 and 30.15 Stoo switches temporarily to his laptop mic so there’s an echoey few minutes there. Contact the show via email at podcastonfire at googlemail.com, via our forum (containing EXCLUSIVE content and announcements! ), Facebook or Twitter (@podcastonfire, @sogoodreviews) and SUBSCRIBE to our iTunes feed!